All-purpose sanded grouts are especially designed for mosaics. They provide hard, uniformly colored, wear resistant joints with greater bond and compressive strength than other grouts. The grout is packaged in 2-pound reusable containers for easy handling and storage. 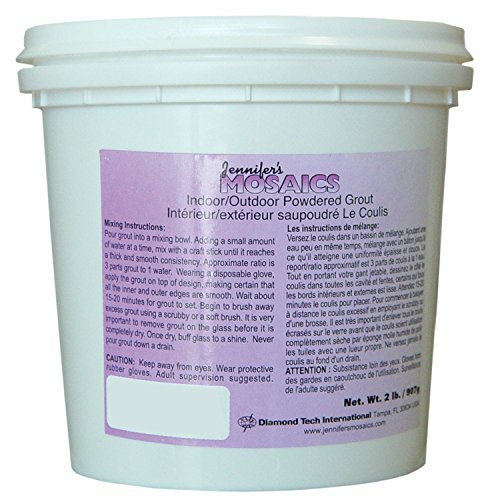 Excellent workablilty, great for indoor and outdoor use and easy to use formula; just add water, mix and grout. Mosaic directions included. Use for grout lines over 1/8-inch. STRONG BONDING JOINTS - This grout provides hard, uniformly colored, wear-resistant joints with greater bond and compressive strength than other grouts. INDOOR / OUTDOOR USE - Use in bathrooms, on kitchen backsplashes, arts and craft projects, or any outdoor tile work. EASY-TO-MIX FORMULA - Just add water, mix, and grout. Add water in a 3:1 grout to water ratio. MAKE MOSAICS - Create beautiful pieces of mosaic art for the home or garden. This sanded grout is multi-purpose but specifically designed for mosaics. RESEALABLE CONTAINER - Use some now, keep some for later. This plastic tub comes with a lid, don't worry about having an open bag of grout lying around. If you have any questions about this product by Jennifer's Mosaics, contact us by completing and submitting the form below. If you are looking for a specif part number, please include it with your message.